Aksharwadi Temple, dedicated to Lord Swaminarayan, serves as a place for enlightenment as well as education and entertainment for many years. From the main temple to gardens, each and every element related to the shrines echoes spirituality. This intricately carved structure, built by the society of BAPS Shri Seva Sansthan, contains various terracotta works, wall paintings and idols of many deities including Kanhaji's cradle (Lord Krishna). The temple bears a close resemblance to the Swaminarayan Temple in London. 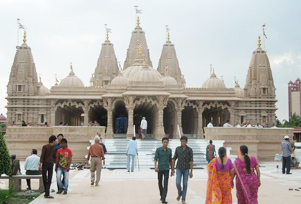 Other than Bhavnagar, one can find Swaminarayan temples in New Delhi and Gandhinagar that stand as a testament to the 10,000-year-old culture of the Indian subcontinent.